1Candidate, Faculty of Science, Mahasarakham University, Kantarawichai, Maha Sarakham, 44150, THAILAND. 2Faculty of Science, Mahasarakham University, Kantarawichai, Maha Sarakham,44150, THAILAND. Context: Sphagneticola trilobata (L.) Pruski. is a member of the family Asteraceae and has used traditionally in the prevention and treatment of various diseases. Aim: The research was aimed to determine chronic toxicity of 80% ethanolic leaf extract from S.trilobata (STLE). 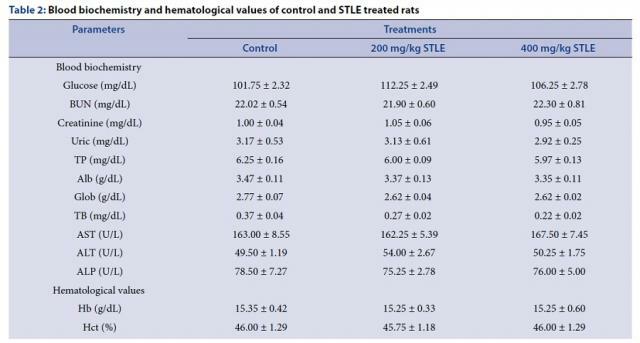 Materials and Methods: STLE at the doses of 200 or 400 mg/kg b. w. was oral given to the healthy Wistar rats daily for 90 days. Statistical analysis used: Statistical analysis was carried out using F-test (One-Way ANOVA) followed by Duncan’s New Multiple Range Test. Results: STLE did not produce any signs or symptoms of chronic toxicity. And also, the mortal rat was not observed during a period of an observation. Furthermore, STLE did not alter the body weight, relative organ (liver, pancreas, kidney and heart) weight, hemoglobin (Hb), hematocrit (Hct), red blood cell (RBC), white blood cell (WBC), mean corpuscular volume (MCV), mean corpuscular hemoglobin (MCH), mean corpuscular hemoglobin concentration (MCHC), neutrophil, lymphocyte, monocyte, platelet, alkaline phosphatase (ALP), aspartate aminotransferase (AST), alanine aminotransferase (ALT), blood urea nitrogen (BUN), creatinine, blood cell characteristics, ultrastructure of RBC, and histological features of hepatic, pancreatic and renal tissues in the STLE treated rats comparing to control rats. Conclusions: These findings indicate that the leaf extract from S. trilobata exerts non chronic toxicity in rats and can be used safely as a traditional medicine or diet complement without any effect on hepatic and renal functions. Suchantabud A, Katisart T, Talubmook C. Chronic Toxicity of Leaf Extract from Sphagneticola trilobata (L.) Pruski. Pharmacognosy Journal. 2017;9(3):323-328.